Our annual homage to Canada was a great success and full of the spirit of adventure. Fishing wise it’s about hitting the ground running and floating a section of the renowned Bow river, the day after landing late at night. I have always used Mike Gifford at Country pleasures who always uses the best guides available. 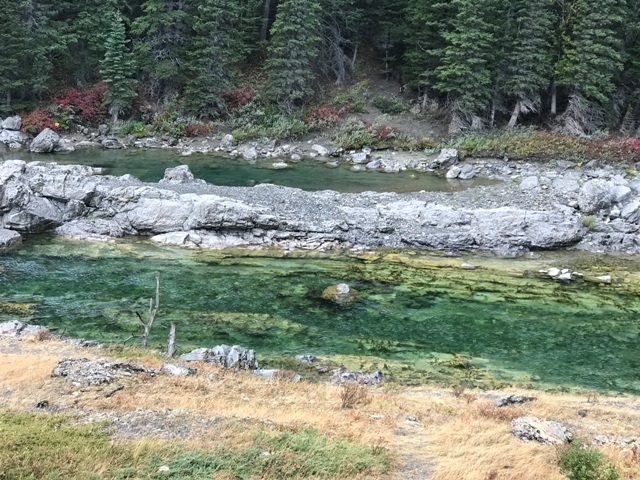 The Bow is a blue ribbon stream known for its 20 inch plus fish and “bullet” bows. The ancestry of these fish is apparently steelhead, a sea run version of the rainbow trout rather like a sea trout to a brown trout. This seems to give them extreme energy and they spend a great deal of their time either airborne and/or stripping line at high speed. The 20 inch fish are a serious challenge for anglers of all ability on 5 and 6 weight outfits. My personal outfit was my vintage Canadian made Loomis GL3, 5 weight coupled with a Lamson Litespeed IV loaded with a DT 5 Cortland Silk 444 and an Onstream-guide furled leader (5-6 weight yellow). I used about 5 feet of 4X Orvis superstrong as tippet. And I only used flies from the website either the soft hackle dry or the deadly Life Jacket Caddis and black magic nymph combination. My boat partner used Blair’s hopper dropper combination. Blair was a very knowledgeable and experienced guide and gave us a day to remember. The life jacket caddis was responsible for this 25 inch plus beast described honestly by Blair as “the biggest dry fly caught rainbow he had seen that year”. What a bruising battle! It ran under the boat at high speed twice, stripped me to the backing on its tail. Fish like these live with you for a long time. What about the local combo versus the Lifejacket and black magic? The rainbows really liked those black magics and I changed the other outfit so my boat partner had my outfit, which was extremely effective. 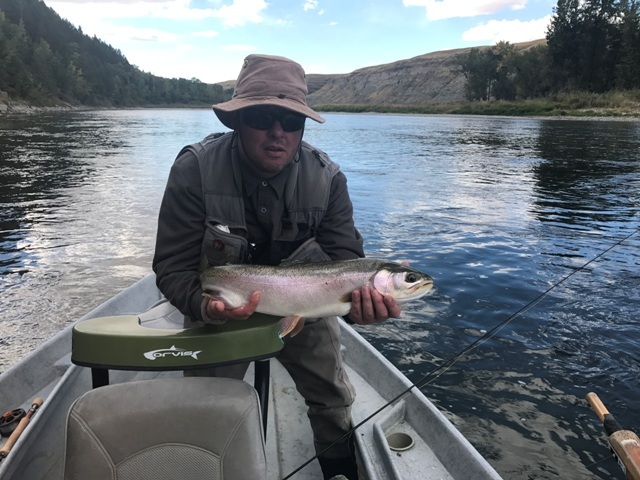 A Bow river rainbow with the size 16 black magic nymph still in the scissors. He quickly started catching some great bullet bows on the black magic nymph. I caught well over 20 quality hard fighting wild rainbows. 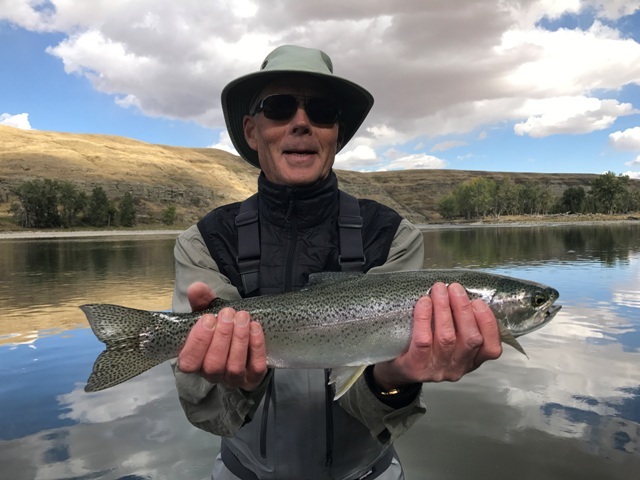 The Onstream-guide flies performed exceptionally well and the barbless hooks held some of the wildest stream fish on the planet with no problem at all. Early in the morning, before things warmed up I caught bows on the new TNT mini streamers, even though Blair mentioned that streamers had not been working very effectively. These small motile mini streamers provoked the required response quite quickly and I was soon landing bullets. Our next day we half recovered from Jet lag and had a curtailed 2 hours on the Crowsnest river due to near storm force winds. We retired a bit jagged after our first day but the forecast was for light winds for the next. We made our way to the famous “Gap” section of the Oldman River, Alberta. It was cold and snowing when we arrived. It was snowing when the river boiled with fish in a blue winged olive hatch. It was one of those rare hatches when fish rise in a clockwork pattern as groups of flies move in waves down the stream. We used a size 16 match the hatch olive and took every fish we covered at zero degrees Celsius, in a blizzard, in the middle of the rockies. 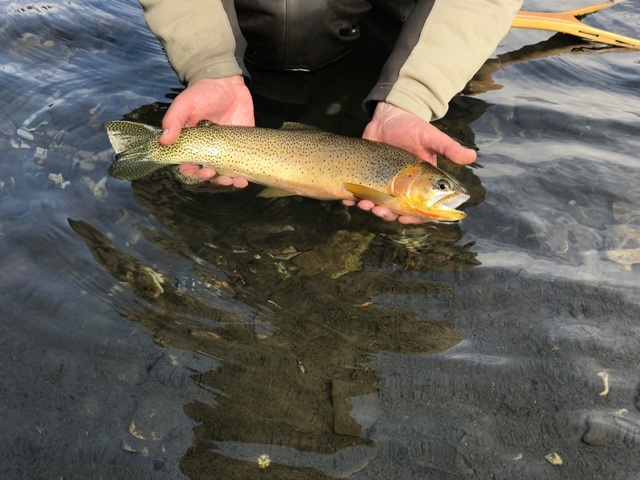 It was a great experience catching those eastern slope cutthroat trout. We actually left a pool of rising fish in the end happy, and no longer needing to catch. 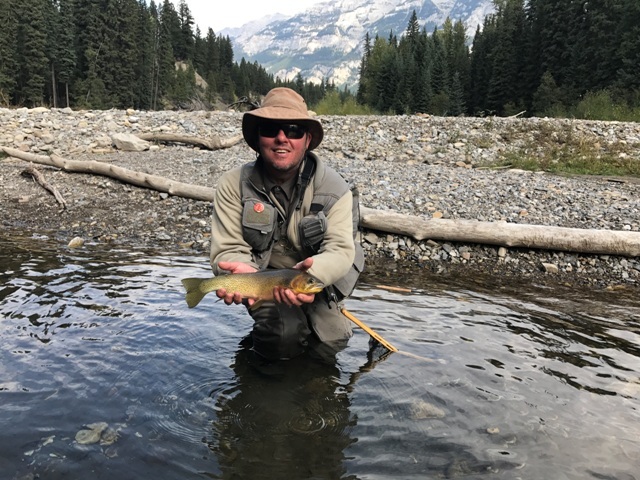 We then moved onto British Columbia and did some fantastic fishing there in a classified waters rivers containing pure strain Western cutthroat trout. These trout are relatively naive compared with UK brownies. They are just about the easiest fish to tempt up to a well presented dry fly although it does have to be that. They refuse even slight drag.....but even the slow motion refusal from a cutthroat brings a wry smile from the competent angler. He will accept it when you get the pattern or presentation right. In Autumn with the Local October Caddis beginning to hatch in numbers the Life jacket Caddis was superb in faster water, along current seams and in riffles for pulling stunning cutthroats onto the fly. I fished the ever reliable soft hackle dry fly as my search and bring ‘em up fly over larger sections of river. 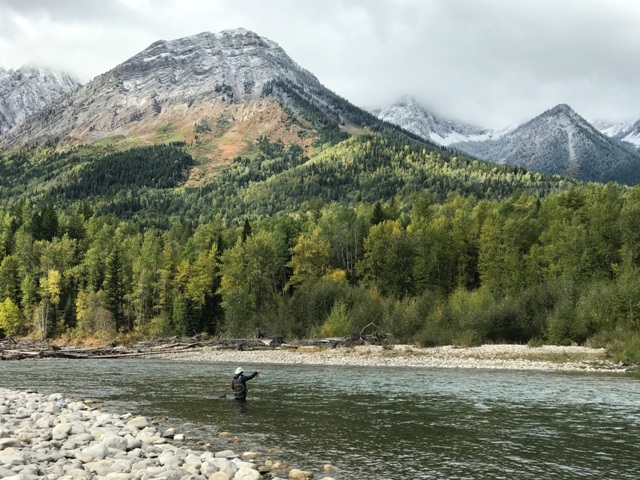 The sight of a cutthroat trout rising slowly and deliberately to intercept a dry fly is one every fly fisherman should experience. These wild and native fish are one of the most free rising fish on the planet over a relatively short fishing season. Today I managed to get out and catch a brownie and say goodbye to the trout season. An Indian Summer will ensure some good dry fly fishing for grayling before we revert to the nymphing outfits.